Amory and Milo Adams have two murder investigations under their belts, and after five years of marriage, they finally seem to have arrived at a place of compromise and understanding. Never satisfied at being in one place too long, Milo has his sights on travel to Italy with his wife for a quiet winter respite. Plans change quickly however when Laurel, Amory’s cousin, emphatically requests her presence at a house party at Lyonsgate, the country house of Reginald Lyons, an old friend of Laurel’s. Although Laurel and Milo have never been overly fond of one another, Laurel and Amory were both only children and their cousins’ bond is as close as sisters, so Amory and Milo accept. The estate of Lyonsgate is a bit rundown and has been uninhabited for many years because it was the site of a raucous party where one of the attendees died. Although the death was ruled an accident, Reginald moved away from the house. Unsure of why Reginald has returned, Amory and Milo are shocked to discover that the other invitees to the house party were the same guests that were present that fateful night, including socialite Isobel Van Allen. Years prior following the accident, Isobel wrote a fictionalized account of a murder at a high society house party that closely resembled the actual events that occurred at Lyonsgate. The publication of the book and the scandal that ensued cost many of the participants heavily: loss of occupations, social exile, and even death. Yet, Isobel doesn’t seem to be finished with the story. She announces the first night at dinner that she is writing a sequel that will reveal even more of the details of that fateful night. Although many years have passed, some secrets are meant to be buried and the truth is not always what it seems. Amory and Milo present an unbiased observation of the events but quickly become embroiled in the lies and the scandal and must work together to unmask a killer. This series has moved into my top five favorite mystery series. The characters are fantastic and the setting of the elite rich following World War I presents a modern view of a society trying to maintain its old traditions and lifestyle in a rapidly changing world. I love the details of the clothing, the cars, and the social nuances of this generation. The way the characters cling to the customs and protocol of their place in society as chaos reigns down around them is truly fascinating. I have mentioned in my previous reviews how much I love the character of Amory. This book actually presents a bit more of her emotional and vulnerable side, which I think reflects the slowly evolving growth of Milo and Amory’s marriage. As someone who doesn’t have a connection to the characters involved in the scandal, Amory is able to present an unbiased viewpoint; however, she quickly become invested in the truth which makes her even more likeable but also susceptible to danger. I am also quite the fan of Milo and love how his character develops in this third installment. He seems to have come to a comfortable place in admiring Amory’s detective abilities but also, surprisingly, shows a fierce sense of protection of her. Events occur that show some of his own vulnerability and fears but he still maintains his unruffled and calm demeanor. A really great, well plotted series with engaging characters and mystery that includes all the necessities of love, revenge, jealously, and greed. 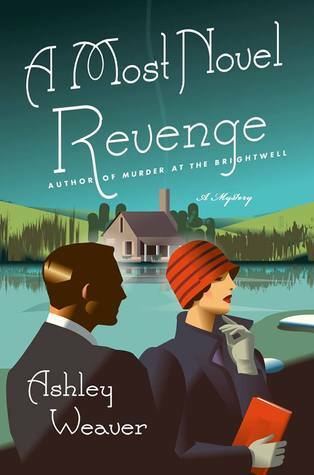 This entry was posted in Book Series and tagged A Most Novel Revenge, Amory Ames, Ashley Weaver, Death Wears a Mask, English country house, Murder at Brightwell, mystery, post World War 1 on October 24, 2016 by kvgaughan.